In his mind, Warren Erickson saw his collection of flags as an invitation to conversation and goodwill. Instead, a handful of neighbors are angry, his homeowners association is firing off new edicts and most of his flags have been permanently retired to a corner in his garage. "There's some friction around here, and I'm not sure why," Erickson said. "It's not like I'm flying the flag that ISIS flies." For the record, Erickson has an eclectic and personally meaningful rotation of flags that are displayed one day at a time outside his home in a tiny gated community in Palm Harbor. On Monday, it's the U.S. flag, followed by a combination U.S.-Canada flag on Tuesday. The rest of the week includes a Bavarian flag, a German flag, a Swedish flag, the U.S. Marine Corps flag and a Wyoming flag. To Erickson, 83, the flags represent a lifetime of reaching out and inviting in. A lawyer in upstate New York before his retirement, he and his wife, Betty, used to host foreign students and families through an exchange program and the Rotary Club. They had visitors from Lebanon, France, the Netherlands, Finland, Japan, Germany and Turkey, among others, at their home in New York. Nearly every visitor was represented by a new flag. "We never sat down and planned the (flag) program," he said. "It just grew." The flags have been flying at his Palm Harbor home since the mid 1990s without incident. The first indication there was a problem, he said, was when the Forest Retreat Homeowners Association started talking about flag restrictions a few years ago. 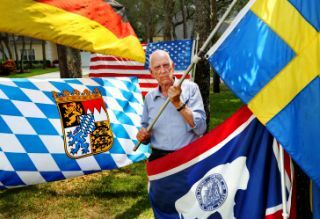 Warren Erickson, 84, with his flags representing, clockwise from left, the German state of Bavaria, Germany, the United States, Sweden and Wyoming. He also has the flags of Finland, the Netherlands, Turkey and the U.S. Marine Corps. Bart Bennawit, the association's secretary/treasurer, said numerous residents had complained about flags over the years, particularly the German flag and a Turkish flag Erickson no longer displays. "We have some older people from Europe who are really offended by the German flag," Bennawit said. Erickson believes he was personally targeted when the homeowners association rewrote some of its regulations last month. The new rules, which conform to minimum standards allowed in Florida statutes, permit a U.S. flag, the flags of U.S. military branches or a POW/MIA flag. Homeowners associations are allowed to ban any other flags. "If someone had a problem with the German flag, they could have come and talked to me about it," Erickson said. "For all they knew, I might have told them to pound sand. But the only way to find out is to come and talk to me. Instead, they go and pass a new rule. They played a game of 'gotcha' with me." Ann Muckey, a board member who lives directly across the street from Erickson, said she has previously spoken to him about the German flag. Muckey, born in Austria, said she is the most vocal opponent of his displays, but insists she is not alone. "Everyone in this neighborhood wants these flags stopped," Muckey said. "They're just not willing to speak, so I am speaking up for them." Erickson, who says he is one of a few original homeowners still in the community, suspects the animosity toward the flags stems from an assessment dispute a few years ago. Before agreeing to change the assessment formula, Erickson said he wanted the bylaws updated. Bennawit says the new flag regulations were among dozens of changes made when the bylaws were updated at Erickson's request. Erickson, however, has an email from the association that says the changes in the bylaws amounted to 250 words in a 45-page document. At any rate, Erickson is now limiting his flag display to those deemed allowable by the association. On Wednesday afternoon, the U.S. Marine Corps flag was gently swaying in the breeze. Both Erickson and his youngest son served in the Marine Corps. I ask how he feels about the situation, considering his original intent was to start conversations and invite camaraderie with his flags. Is he frustrated? Sad? Angry? "I'd say all of the above," he said. "It's a shame. This is a nice community."